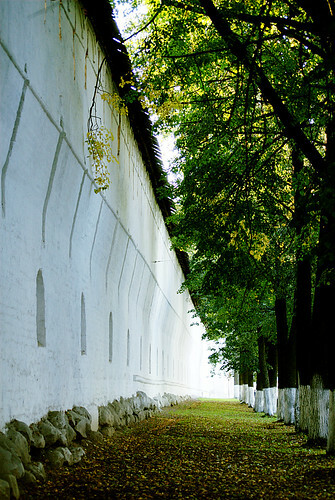 This photo shows one of the walls of the Spaso-Preobrazhenskiy monastery. Saturday, August 22, 2009 in Photo. You can comment (already 2 responses). I find this old gates near Bol'shaya Oktyabr'skay street. Also there is a house, which was built of the similar red bricks. Wednesday, August 19, 2009 in Photo. You can comment. 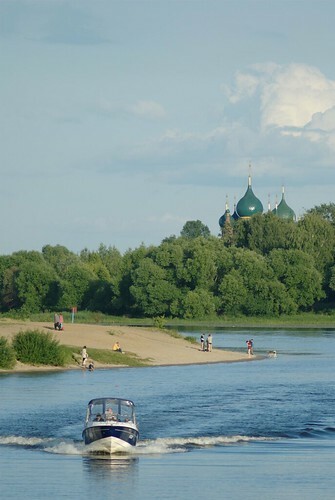 On this photo you can see the Kotorosl river near the Strelka -- the place, where the Kotorosl flows into the Volga. Saturday, August 15, 2009 in Photo. You can comment. 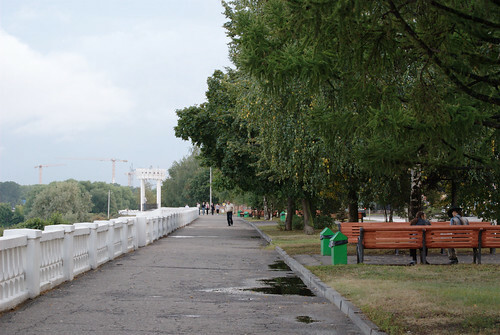 This photo was shot after a hard rain on the embankment of the Kotorosl river near Yubileynaya hotel. This photo was shot on the embankment of the Kotorosl river. 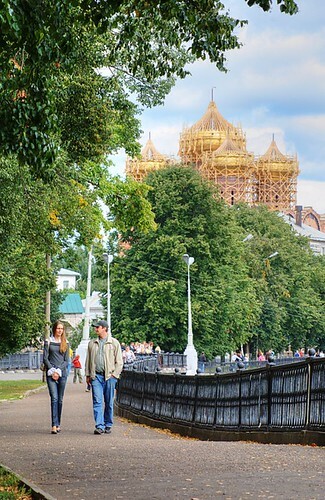 You can see the building of the Uspenskiy Cathedral on the background. Monday, August 10, 2009 in Photo. You can comment. It is a flower gift of "The Golden Ring" cities to millennium Yaroslavl. 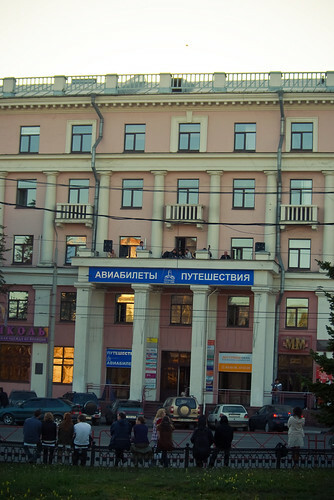 The place nearby the fountain on Andropova street was decorated with flower compositions. 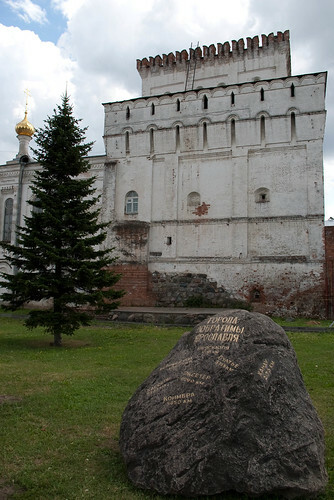 Each of them is an original present of the cities from "The Golden Ring" and some towns of Yaroslavl oblast (Yaroslavl region). The work has just been started. The official opening is on July 9th. In this day there will be representatives from all participated cities: Suzdal, Vladimir, Sergiev Pasad, Rostov, Uglich and other. Wednesday, June 10, 2009 in News. You can comment (already 4 responses). Skomoroshiy Bunt (in Russian: Скомороший бунт) was founded in April, 2005 as "special music project" of the television series "Molodoy Volkodav". Initially the band consisted of Alexander Kasatkin (the leader of the half-folk/half-bard music band "Zabava") and Zakhar Potemkin (the leader of the cult Yaroslavl folk music band "Neizvestnaya Zemlya"). Kasatkin sang and played gusli, Potekin also sang and played lyre. In May several songs was recorded. 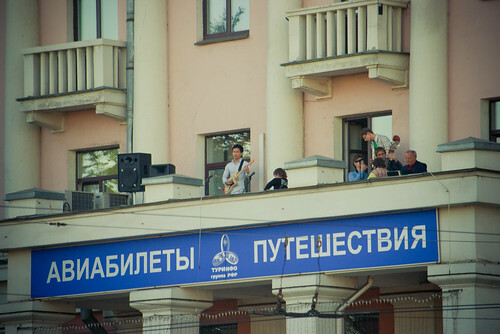 Apart from filming there were two performances: a local bike show and "The Festival of an Orthodox Song". Evgeny Bobkov - vocal, lyre and kazoo. Almost all songs are written by the band. Kasatkin has written 60%, Potemkin - 40%. There are more then 20 songs of Skomoroshiy Bunt. The most part is in album "Natsionalnaya ideya" (in Engish: National idea). In 2008 Internet-album "Geroy" (in English: The Hero) was released. 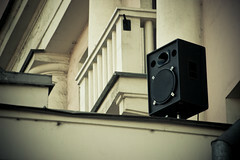 Sunday, June 07, 2009 in Music. You can comment. Two month ago, 27th March, we opened this website for testing and writing first posts. Yes, it is necessary, because nobody wants to see an empty website. Initially, Elina and I have thought up several sections of the blog: photos, stories, history, music, news and podcasts. Today some of posts can simultaneously belong to two or even three sections. Sometimes I can't decide which part of the website is more suitable. I wanted to expand our blog with new section, but we decided to remain the structure intact. Nevertheless, there are lots of project within the blog. For example, there are Yaroslavl details and Yaroslavl Front door. 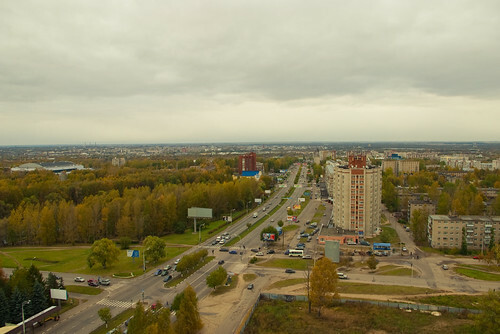 During two month we wrote more than 45 post and sent lots of postcards with the view of Yaroslavl. By the way, if you want to receive a postcard then contact us. Within a short time there will be some new projects. I think that you will be interested in these posts. So, I want to make a short summary of some our interesting existed posts (three for each section). 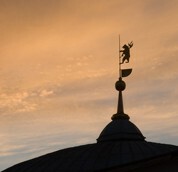 Yaroslavl For Me Podcast, Episode 2 "The Volkov Theater"
Yaroslavl For Me Podcast, Episode 3 "The Volga River"
I hope you carry on reading our website. We say thank you to all our visitors! Wednesday, May 27, 2009 in News. You can comment. We continue our series of Yaroslavl front doors which made by LJ user yanlev. One of our readers complained of bad photo quality, so I've decided to correct some of yanlev's photographs. Possible in the future we will take photos on our own. It's Sakin's rented apartment house. This building was built in 1907 year. Mikhail Sakin was a famous Yaroslavl supporter (patron). 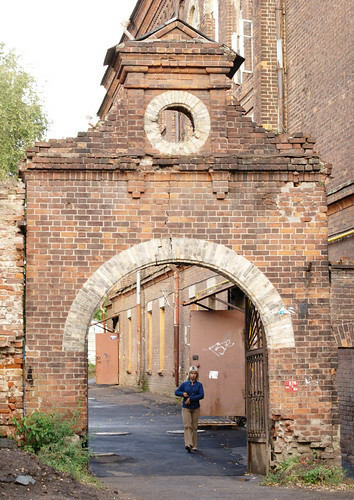 In 1880s his father founded a weaving mill nearby the city. Today it is Krasnye tkachi (Красные ткачи). 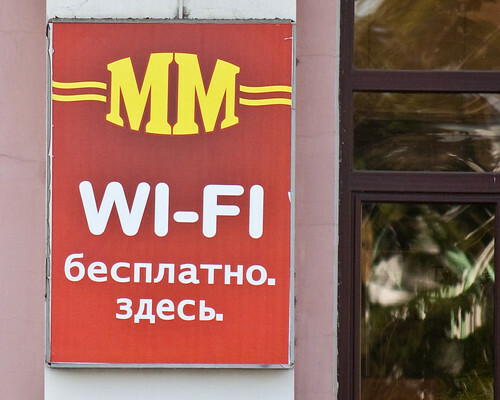 Mikhail liked the mill and worked a lot but ungrateful workers had been being on strike for two weeks. 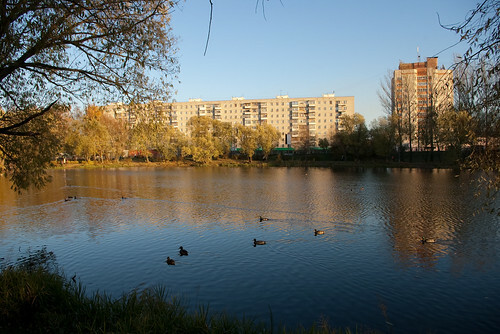 After that incident he decided to give up the mill and take up his apartment house on Netecha street (ул. 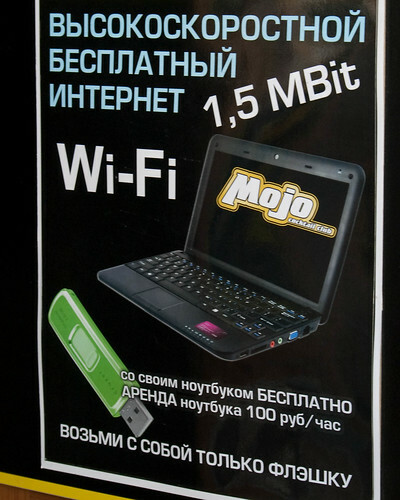 Нетеча). 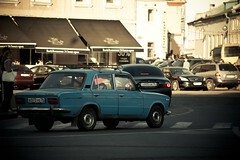 It's Sobinova street (ул. Собинова) now. The door is modern but simple and fits into the facade. This vertical implements three functions: the entrance, the living room and the balcony. The staircase remains intact. And judging by carpet holders we can see that it was restored and not only one time. Pay attention on staircase legs: they are in a Art Nouveau style. This pattern is a "classic" Art Nouveau. There is a big window with handsome frames on the first floor. The landing is spacious and neat but not light. This narrow windows give little light. But Sakin was one of the first who used elictricity in 1907 year. It is an original door of 1900s! Wednesday, May 27, 2009 in Story. You can comment (we have one response).